I'm real partial to Japanese rims for the Japanese car... Popular Japanese brands are SSR, Volk Racing, Advan, and Blitz. Like tires, the more the rims cost, the better the quality. 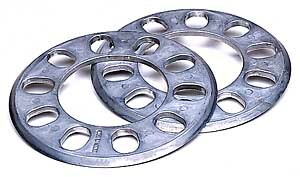 Cheap rims use very poor castings with low quality metals. This ends up with a rim that bends or cracks very easily. Also, you really don't want to go with an ultra-light weight rim on the street, as bump and pot holes can easily damage them! The fronts can go 8" wide before running into major fitment problems. The rears can easily go 9". Just watch the offsets and everything should be close. Again, tire profile has a huge bearing on if you run into fitment problems, so try and see if you can find someone who has run a similar combination of rim specs and tire models you've been eyeing. If you do run into minor fitment problems on the inside (i.e. suspension), you can use spacers to get some clearance. If you're rubbing the fenders, then you need to get your fenders rolled. Rolling your fender is the process that bends the inside lip upwards for additional clearance for your tires. DISCLAIMER: THESE NUMBERS ARE TO BE USE SOLELY AS A GUIDE. The below tables are for stock or stock replacement struts and shocks. Aftermarket coilover kits can allow for more clearance on the insides due to adjustable spring perches that can be rotated upwards; you can add another 10mm of offset if you have this type of suspension. Sometimes you can't always get the perfect offset for your application, or you just couldn't turn down an awesome deal that was just too hard to pass up. If you offset is relatively close, you can use wheel spacers to get you some additional clearance from the in-board suspension components. Mr. Gasket offers wheel spacers that are easily available from most domestic V8 performance shops, or you can order them online.